England defender Glen Johnson is kicking it with Lotto for the World Cup 2010 Qualifiers. 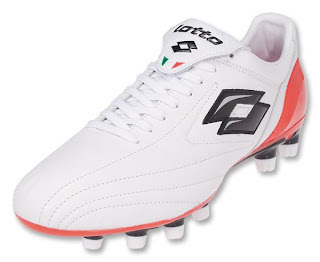 Last Saturday, England defender and newly signed Lotto testimonial Glen Johnson was lined up in the qualifying match against Andorra wearing the Lotto Zhero Leggenda Due Soccer Boots(White/Fiery Red). The 24-year-old the Portsmouth Captain just signed a three-year deal with Lotto, which also includes the sponsoring of the player's football school based in Kent involving over 2000 children. After 4 years with Chelsea and winning two Premier League titles, Johnson joined Portsmouth last season, crowning the season with the 2008 FA Cup. The signing of Johnson signifies an important partnershp which will enhance the brand awareness of Lotto not only in the UK but also at international level. The initial result: Johnson was taken down hard in the 49th minute and the consequent free-kick led to the first England goal.